Our patented technology allows for the design of custom pallets that meet the specific needs of individual companies and/or product lines. 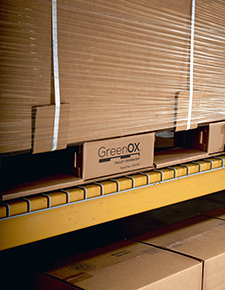 Green Ox Custom Corrugated Pallets fit the pallet to the product (not the other way around) and can be designed for specific loads, handling, shipping modes, and business models. Companies benefit from design flexibility, cost savings, and quick turnaround when working with us to develop a custom pallet. Green Ox Pallet Technology is unique in its custom design possibilities, which are either technically impossible or cost prohibitive for other corrugated pallet options. Our custom pallets are rigorously tested using ISTA guidelines by our internal testing lab, assuring pallet performance, product delivery, and supply chain continuity. In addition to our internal testing, we also have clients perform their own tests specific to their product, load weight / distribution, load configuration, shipment type, unification, and pallet use. Green Ox Custom Corrugated Pallets can be designed to any size up to 72×66 (for example, 56×44, 36×36, and 30×30 are a few of the custom sizes we’ve developed for some of our clients based on their unique needs). Manufacturing is available anywhere with delivery options that meet just-in-time provisioning as flat or assembled pallets in any size and quantity.